Here’s a bar bet you energy investors can use: Hey, how much if any is the world under-supplied oil right now? The answer, says one highly respected voice, would surprise you: They say the global oil market is currently undersupplied by 2 million barrels per day. That’s a very bullish statement, and a bit out of consensus right now. The problem with making oil price predictions is—getting reliable supply and demand data is next to impossible. There are concerns about some of the data from the IEA in Paris, the EIA in Washington, and OPEC. On the supply side of things there are few people who should have better data than Core Labs (CLB-NYSE). Core Labs are the global leaders in understanding reservoir performance. With offices in 50 different countries Core Lab has a client list that includes oil and gas majors, national and independent oil companies. On a daily basis the company gets real time production data from producing basins across the globe. They can actually see what production is doing in real-time. Much of this data comes from Core’s “Joint Industry” project which involves global E&P producers agreeing to provide data on their reservoir performance with Core. The appeal to the producers that contribute the data is that having Core Labs study accumulated data across the industry allows Core to come up with better reservoir solutions for everyone. In addition to having access to data most others don’t, CLB’s past predictions provide some further reason to believe what they are saying. In the company’s second quarter 2015 conference call Core indicated that it expected 2016 U.S. production fall by at least half a million barrels per day. According to EIA data, U.S. production did exactly that. In their just completed conference call, Core Labs revealed that they in fact do believe that the global oil market is indeed undersupplied by 2 million barrels per day. “From July to December of 2016, worldwide crude inventories fell by an average of approximately 770,000 barrels of oil per day. In addition, considering the January 2017 OPEC cuts of approximately 1.3 million barrels of oil per day, plus cuts from cooperating non-OPEC producers, including Russia, the world market could be under-supplied by more than 2 million barrels of oil per day. If accurate this is obviously important for investors. There are two parts to it. The first is that the global oil market was undersupplied by 770,000 barrels per day in the second half of 2016 prior to the OPEC cuts. That would be 138 million barrels of oil over those 6 months of the year. That should show up in global oil inventories. That is historical so we should be able to check it. That is most of the decline that Core Labs refers to and it isn’t that hard to imagine a 38 million barrel decline in non-OECD inventories (think Saudi, Iran, China) over that time as well. Verifying that is virtually impossible to do, but there is at least one article that suggests that Iranian floating storage that started 2016 at 40 million barrels is now drained. The second and larger part is the 1.3 million barrel per day OPEC cut that was instituted in January. To date the International Energy Agency reports that OPEC has achieved a 98 percent rate of compliance with those planned cuts. Not every country has done exactly what it promised, but the Saudis have done more than their part to bring the group compliance pretty much in line. Considering all of this, there does seem to be reason to believe that Core Labs statement of 2 million barrels of undersupply claim has some merit. If This 2 Million Barrel Undersupply Is True – What Does It Mean? If the global market for oil is now undersupplied by 2 million barrels per day it means that global inventories would come down by 730 million barrels over the course of 2017. That isn’t bullish for oil. That is uber-bullish for oil. That would wipe out a full quarter of global oil storage. Investors should also remember there is very little spare capacity in world production right now. One could argue the existing high inventories IS the spare capacity cushion the world has between here and $100 oil again. But will that undersupply last for the entire year? Let’s think about the various moving parts. First, there is global oil demand. Core Labs believes that global oil demand growth will be at least 1 million barrels per day over the course of 2017; likely a little higher. And that is consistent with most years. By itself this demand growth would mean that our daily undersupply would increase to 3 million barrels per day by the end of the year. Second, we have the Permian and U.S. shale production. U.S. production declined by 550,000 barrels per day in 2016 but this year it is going to grow, no doubt about it. Core Labs suggests that the U.S. could grow by 500,000 barrels per day in 2017. I’ve seen estimates as high as 1 million barrels per day, but it will depend on the price of oil. It likely won’t cover the increase in global demand. Third, production in the rest of the world. Core Labs believes the global production decline curve to be 3.3 percent. Apply that to the 45 million or so barrels of production that is outside of OPEC/Russia and the U.S. and we could see 1.5 million barrels per day of declines. Are there enough big projects coming on stream to offset that? 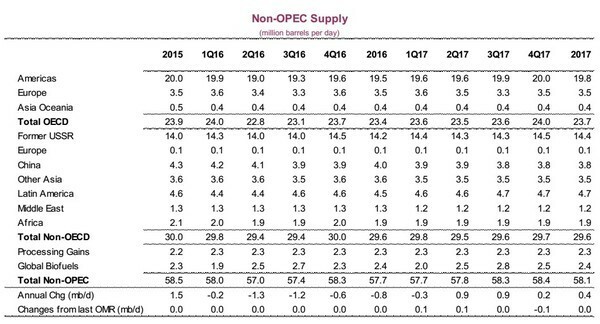 The IEA is predicting total non-OPEC production (including Russia and the U.S.) as increasing from 57.7 million barrels per day in 2016 to 58.1 million barrels per day this year. All of that is in the U.S., so the IEA expects the rest of the world to tread water this year. Fourth, what will OPEC do? Compliance with the production cuts to date have been good. Will that continue if the cuts are extended? Rather than speculate let’s look at what they need to do. Plus: Declining Non-U.S. Production – ??? Add these all together and I get at least a 2 million barrel per day shortfall by the end of the year. Perhaps considerably more if global production declines. That would mean that OPEC could bring its full 1.3 million barrel per day cut back on line and the world would still be consuming 700,000 barrels more than is supplied per day. To Summarize – A Coming Oil Rally? 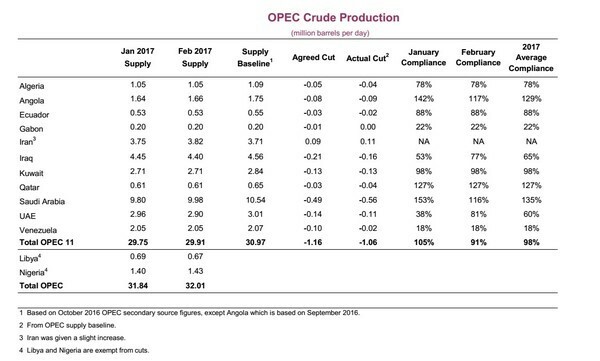 If Core Labs is correct, then if OPEC holds its current production level for the first 6 months of this year at least 360 million barrels of oil that is currently in storage should disappear. That would get inventory levels to where we were near the start of 2014 before the glut started building. We also need to consider that with global oil demand 4 million barrels per day higher today than it was in 2014 we will consume an extra 1.46 billion barrels of oil over the course of 2017. A start of 2014 inventory level would be much tighter on current demand levels. That should be enough to light more than a little fire under the price of oil by the middle of the year……if it is all true. EDITORS NOTE: I just bought a debt-free oil stock that I believe is guaranteed to grow huge in the coming 5 years–even if oil stays at $50/barrel. It has a unique business model. And it was one of the very few energy companies that increased its dividend in 2016. Capital gains and dividend increases–that’s what I like! Get the name and symbol by clicking HERE.